Barack Obama will be returning to The Tonight Show with Jay Leno Thursday night. 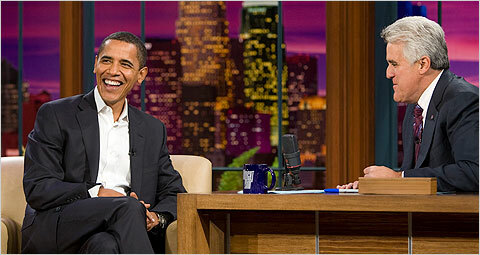 Obama previously appeared on the show in 2007 (pictured above). It is far less common for a sitting president as opposed to a candidate to appear on the late night talk shows. The funny thing is, of course, that socialists know that Barack Obama is not one of us. Not only is he not a socialist, he may in fact not even be a liberal. Socialists understand him more as a hedge-fund Democrat — one of a generation of neoliberal politicians firmly committed to free-market policies. The first clear indication that Obama is not, in fact, a socialist, is the way his administration is avoiding structural changes to the financial system. Nationalization is simply not in the playbook of Treasury Secretary Timothy Geithner and his team. They favor costly, temporary measures that can easily be dismantled should the economy stabilize. Socialists support nationalization and see it as a means of creating a banking system that acts like a highly regulated public utility. The banks would then cease to be sinkholes for public funds or financial versions of casinos and would become essential to reenergizing productive sectors of the economy. The same holds true for health care. A national health insurance system as embodied in the single-payer health plan reintroduced in legislation this year by Rep. John Conyers Jr. (D-Mich.), makes perfect sense to us. That bill would provide comprehensive coverage, offer a full range of choice of doctors and services and eliminate the primary cause of personal bankruptcy — health-care bills. Obama’s plan would do the opposite. By mandating that every person be insured, ObamaCare would give private health insurance companies license to systematically underinsure policyholders while cashing in on the moral currency of universal coverage. If Obama is a socialist, then on health care, he’s doing a fairly good job of concealing it.